Some of the world’s most distinguished architectural firms are competing for the $8.5 billion expansion plan for Terminal 2 at O’Hare International Airport. Mayor Rahm Emanuel has opened the competition to the public, directing people to the Chicago Department of Aviation’s website to vote on five final designs. “I do want to underscore, to my knowledge, this is the first time any terminal has ever been submitted to the public for commentary and for vote,” Emanuel said. What’s unclear is how much those votes will influence his committee making the final recommendation – and who exactly is on that committee. All five proposals include ultra-modern, undulating designs. And the majority of the submissions rely heavily on the use of greenery and trees – an attempt to essentially bring the outdoors inside. One proposal even includes hammocks strung on trees. What’s not included in the plans are many of the details – like how security will be handled. The massive project is scheduled to open in 2028. 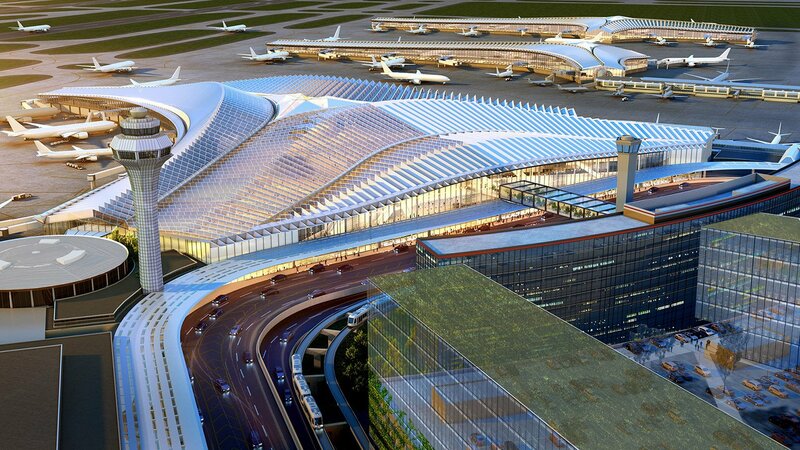 Terminal 2 will be the first of its kind in the U.S., with both domestic and international flights under one roof. “You can get off United for domestic flights and connect to an international flight or vice versa without your Fitbit,” joked Emanuel. “If you look at what we’re doing at O’Hare, we added Midway’s capacity to O’Hare,” Emanuel said. Chicago Tribune Pulitzer Prize-winning architecture critic Blair Kamin joins us to discuss the proposals. Team 1: Fentress-EXP-Brook-Garza offers a unique rolling exterior. Team 3: Studio ORD brings the outside in with many trees inside the sprawling terminal – a possible reference to the former life of O’Hare as an orchard. Team 4: A proposal by Skidmore, Owings & Merrill, the firm that designed the Sears Tower, includes hammocks strung on trees for passengers to relax while they wait for their flights. Team 5: The design by Santiago Calatrava, known locally for his failed Chicago Spire project, resembles the Concorde airplane from the outside.